There are different fears among marketers that Conversion Rates Optimisation (CRO) hurts Search Engine Optimisation (SEO) or another way around, SEO hurts CRO. In this article, we’ll tell you how in fact they are related and how you should care about both of them. 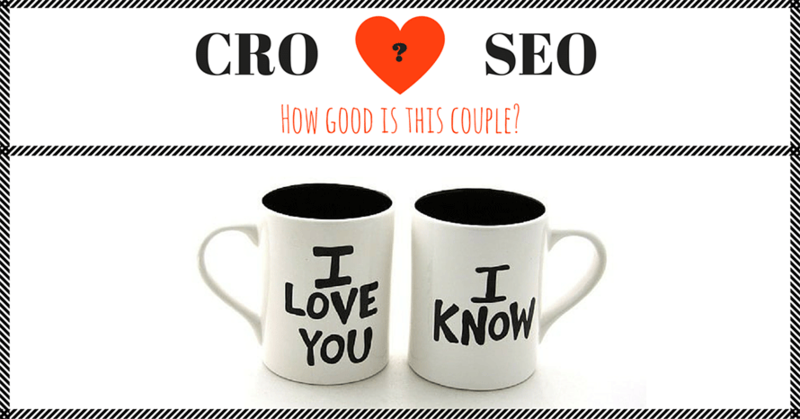 Ok, first of all, let’s define what is CRO and what is SEO. What is Conversion Rates Optimisation (CRO)? As Wiki tells, In internet marketing, conversion optimization, or conversion rate optimization (CRO) is a system for increasing the percentage of visitors to a website that converts into customers, or more generally, takes any desired action on a web page. Referring to the same Wiki, Search engine optimization (SEO) is the process of affecting the visibility of a website or a web page in a web search engine’s unpaid results — often referred to as natural organic or “earned” results. In fact, search engine optimization is the process of obtaining potential customers from organic search by improving and modifying a website, building brand awareness, maintaining solid off-site reputation, etc. Today SEO marketers are required to understand and practice not only SEO but also social media marketing, CRO, web analytics and much more, at least to some extent. Nevertheless, there’s usually a bottom-line common denominator in all of these practices: a need for conversions. The same what marketers have while implementing a CRO process. Every beginning entеrpreneur knows the pain of no traffic or not converting traffic on his website. Traffic without conversions is completely worthless. There may be tons of causes why a site doesn’t bring revenue but generally there are two main reasons: bad traffic and bad user experience, which are also interrelated. Bad traffic. SEO is primary on this stage, so the speech is about bad SEO traffic, first of all. 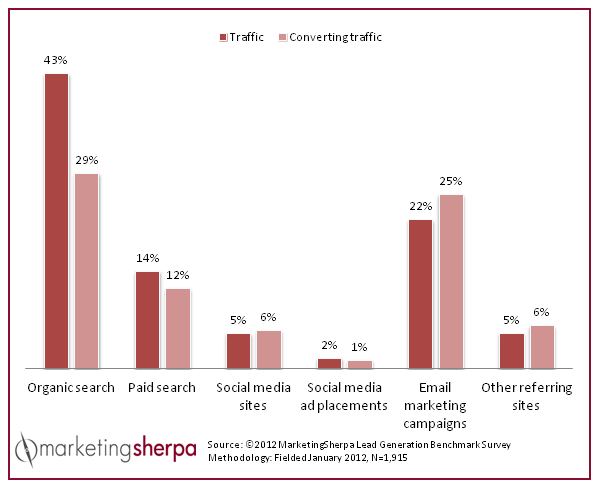 By Note one important thing that often organic traffic is one of the highest converting channels. Due to Google’s increasingly sophisticated algorithms, intent and match are usually pretty high for this channel. And the reason for not getting precious SEO traffic is very simple: a website is not optimized for search engines. But what does it mean? Besides scanning keywords sets, Google also examines user behavior at the site and the factors that make visitors happier, e.g. site speed, time on a website and much more, that is UX indirectly. Bad user experience (UX). The second reason for not getting conversions is bad UX when conversion rates optimization is highly required. First of all, it’s very hard (if isn’t possible at all) to get high-quality search traffic if your website isn’t good for users (read the first point, why it is so). The variants of causes of bad user experience may be various: a product/service is ill-defined, you’re offering too much at once on one page, not using persuasive language, no clear call to action, no call to actions on the first screen and much more you can read our other article about the most common website conversion killers. In truth, neither SEO, nor CRO, nor PPC, nor any other course of your digital marketing strategy can stand on its own. They all must work together for the best results. Nevertheless, some people are still scared that CRO techniques could be harmful for their SEO efforts, or backward, SEO changes could harm the user experience. It’s unlikely even because Google has its own split-testing software: Google Analytics Content Experiments. They also have blog posts from their Webmaster Tools team telling you not to worry about it, and explaining that they recognize the testing software and can figure it out. So you’re very safe on that front. A page optimized for conversions will be more friendly for visitors and comfy to use, which makes it more likely to get backlinks and referrals. 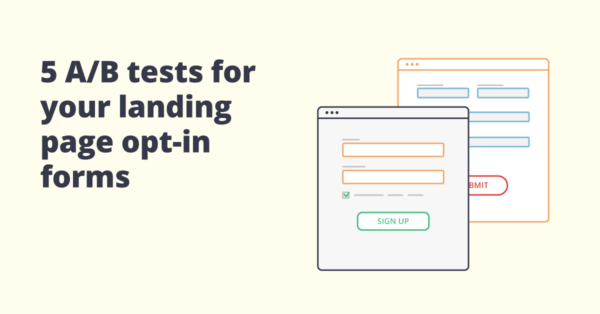 Search engines reward websites that update their content frequently, so it doesn’t hurt to keep your website updating (both content and layout) and makes a great case for constant testing! The page optimized for conversions should be using more relevant keywords that match better what visitors are searching for. Research. Researching is certainly an important activity in both of the marketing activities. A proper SEO research procedure (which is also good for conversion rates optimization) focuses on getting a segmented audience with different intention characteristics by choosing proper keywords and using them in the appropriate places. It’s all about getting the right visitors in line by understanding their demands and desires. Headlines. Improve the relevancy of your H1 tags with clear, compelling and keyword-rich text. The headline text is usually the first thing to catch a user’s attention and an important element both in SEO and CRO. Sometimes, changing a headline you may drastically improve conversion rates on a website. 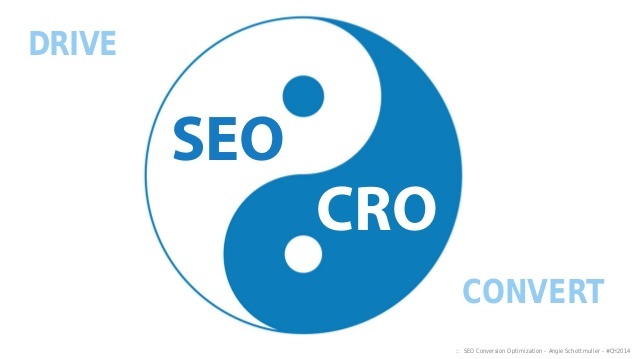 So, coordinate efforts to prepare right titles which will work both for SEO and CRO. Optimize existing content. Properly use keywords and related phrases in a natural and compelling way along your site. Be helpful and create value for your visitors, not only communicate your brand’s benefits and features. Ask the right questions, and provide the answers, smartly keeping in mind a SEO and SMO strategy. Spotlight important information above the fold. Whenever possible, make sure your page layout emphasizes unique and important visible content above the fold with a clear value proposition. Serve your readers and hold their attention fast with inspiring and creative text. Be aware of Google’s Page Layout Rules to avoid being penalized, as well as user experience issues. Increase social interaction. Implement viral components to your site, such as reviews, social media sharing buttons, ratings, visitor comments, etc. Encourage your visitors to engage with your content, as well as produce and share their own content. In terms of SEO, you’ll maximize the potential to acquire more long-tail, organic traffic, and you may improve your social signals, as well as your search visibility (e.g. by embedding Structured Data Markup for reviews). In terms of CRO, you can leverage social proof on your website, that may also lead to better conversion rates. Improve the structure of your site. As Google recommends in its Webmaster Guidelines, construct a website ‘with a clear hierarchy and text links’. Use an organized and clear structure of your website to improve usability experience. Include internal editorial links in the right context and call-to-action manner. Improve landing page performance and engagement metrics. Analyze your landing pages, understand the weak spots and A/B test your hypothesis. By doing so, you’ll potentially minimize bounce rate from search and improve user satisfaction. Speed up your website. A fast website is truly necessary both for SEO and conversion rates optimization. Page speed influences not only organic rankings but also provides increased user satisfaction and these two factors are interrelated. Test your website’s performance with such tools as WebPageTest.org to be sure you’re not losing at this point. Become more analytical. 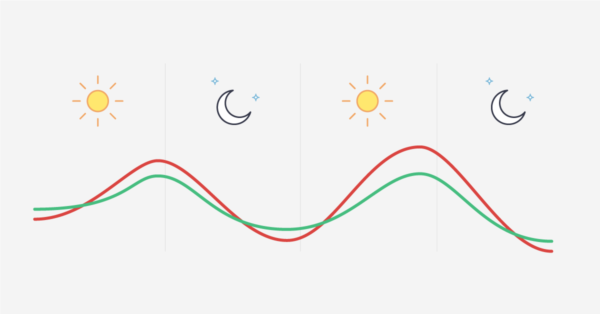 Measure and analyze your analytics data. This stage is crucial for all marketing fields. Make your digital analytics tools your best friends. Be creative. Think different, keep learning and never stop testing. And the last but not the least thing. Professional online marketers continuously handle tests. But, there’s a pervasive misconception, or maybe an irrational fear, that A/B testing can hurt your search rankings. It’s false. Add your variation pages to your robots.txt file during the testing period to block spiders for a double layer of protection against duplicate content penalties. Use the same title tag, URL slug, and meta description on your variations as on your control pages. Once a winning page has been determined, it should be double-checked for SEO best practices. When you replace your control (or another old page) with the new higher-converting page, use a 301 redirect from your variation page URLs in case anyone linked to one of the variation pages during the test. Have some thought on the theme? Add your tips and comments in our comments section!